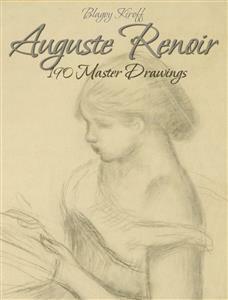 Pierre-Auguste Renoir is French painter who was important figure in the development of the Impressionist movement. The female nudes were one of his primary themes. His early work reflected many influences including those of Courbet, Manet, Corot, Ingres and Delacroix. Under the influence of Gustave Courbet and painters of the School of Barbizon he turned to plein air painting. Together with Claude Monet he develops the new painting style of Impressionism around 1870; Renoir is regarded as one of its main representatives. He partakes in three group exhibitions of the Impressionists, for financial reasons he then again shows works at the conventional salons. Renoir first began to experiment with pastel in the mid-1870s, shortly after Manet and Degas, and his interest in the medium intensified during the following decade. In contrast to his drawings, which he exhibited infrequently, he considered his pastels integral part of his oeuvre and regularly showed them in public. Pierre-Auguste Renoir is French painter who was important figure in the development of the Impressionist movement. As a celebrator of feminine beauty "Renoir is the last representative of a tradition which runs in a straight line from Rubens to Watteau." Renoir's artworks are famous for their vivacious light and saturated color, most frequently focusing on people in friendly and intimate compositions. The female nudes were one of his primary themes. In typical Impressionist manner, Renoir suggested the details of a picture through liberally brushed touches of color, so that his figures softly fuse with one another and their environment. Famed for his sensual nudes and charming scenes of pretty women, Renoir was a far more complex and thoughtful painter than generally assumed. He was a founding member of the Impressionist movement, nevertheless he ceased to exhibit with the group after 1877. From the 1880s until well into the twentieth century, he developed a monumental, classically inspired style that influenced such avant-garde giants as Pablo Picasso. Renoir was born in Limoges 1841 in a working class family. In 1845 his family moved to Paris where he went to work at the age of 13 as a decorator of factory-made porcelain, copying the works of Boucher. From 1862 to 1864 he attended the Ecole des Beaux-Arts in Paris and studied under Charles Gleyre. Here he met Frederic Bazille, Claude Monet and Alfred Sisley. Renoir exhibited at the Salon in 1864. His early work reflected many influences including those of Courbet, Manet, Corot, Ingres and Delacroix. Under the influence of Gustave Courbet and painters of the School of Barbizon he turned to plein air painting. He began to earn his living with portraiture in the 1870s; an important work of this period was Madame Charpentier and her Children. Together with Claude Monet he develops the new painting style of Impressionism around 1870; Renoir is regarded as one of its main representatives. He partakes in three group exhibitions of the Impressionists, for financial reasons he then again shows works at the conventional salons. However, his situation improves as the art dealer Durand-Ruel is his reliable customer. Renoir developed the ability to paint joyous, shimmering color and flickering light in outdoor scenes such as The Swing and the festive Moulin de la Galette. Renoir first began to experiment with Pastel in the mid-1870s, shortly after Manet and Degas, and his interest in the medium intensified during the following decade. In contrast to his drawings, which he exhibited infrequently, he considered his Pastels an integral part of his oeuvre and regularly showed them in public (for example, at the First and Second Impressionist Exhibitions, the 1879 and 1880 Salons, and his solo exhibitions at La Vie Moderne in 1879 and Durand-Ruel in 1883). He rarely employed Pastel for his formal portrait commissions, however, reserving the medium for works in which the sitters were friends or family (and almost exclusively young women and children, whom he saw as particularly appropriate subjects for the delicate, luminous effects of Pastel).